Photo: Honeyman Group Installs HydroGienic® Water System at Quotient’s Science Campus in Edinburgh. 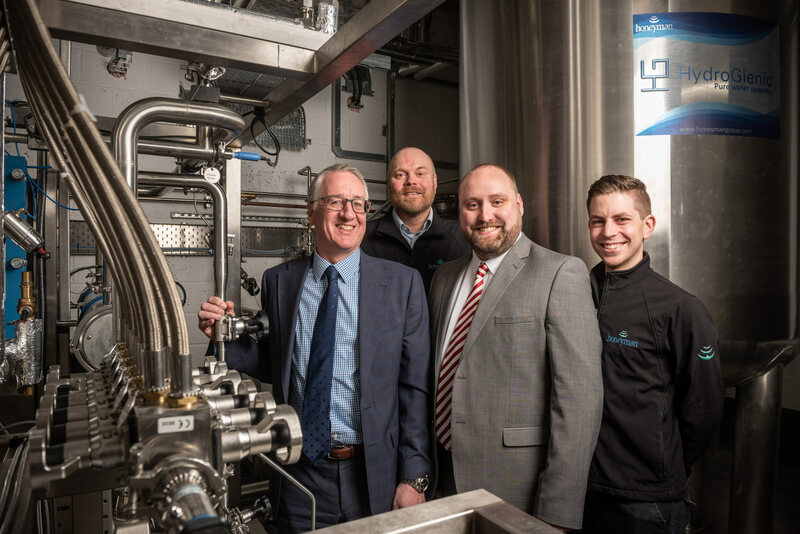 (L-R) Gordon Robb (Vice President of Operations of Quotient), John Backes (Honeyman Group Operations Director), Tom Honeyman, (Managing Director of Honeyman Group) and John Widdowson (Honeyman Group Engineering Team Leader) at the opening of Quotient’s Campus. Winner of the prestigious Queen’s Award for Enterprise: Innovation 2018 and the international Cleanroom Technology Innovation Award 2018, HydroGienic® is a tried, tested and trusted plug-and-play pure water distribution system. A recent adopter of the HydroGienic® system is Quotient, a commercial-stage diagnostics company committed to reducing healthcare costs and improving patient care. The company offers innovative tests for blood grouping and serological disease screening, commonly known as transfusion diagnostics. The company recently inaugurated its state-of-the-art Allan-Robb Campus, just outside of Edinburgh, which houses the company’s R&D, reagent manufacturing and management. In commissioning the construction of the campus, Quotient selected Honeyman’s HydroGienic® system over other options on the market. “The key advantage to us of the HydroGienic® system is the ability to bring down parts of the system while keeping the rest of the system operational. This translates into two major operational benefits. The first is that this gives us the ability to maintain production, while enabling us to isolate the impacted area. Second, it reduces spending on externally sourced water, which in turn removes the guessing game for purchasing,” said Gordon Robb, Vice President of Operations of Quotient. Photo: HydroGienic® Water System at Quotient’s Science Campus – Skid, Storage and Distribution to Outlet Manifold End User Point. Photo: Quotient Operative at HydroGienic® End User Point. HydroGienic® is a bulk pure water distribution system developed by Honeyman Group Ltd to address problems and restrictions associated with existing systems in the pharmaceutical industry. Typical water distribution systems work on a stainless steel ring main style layout. This means that if one part of the factory requires changes made to their water supply, the whole system has to be closed down and re-validated before it can be used again. The HydroGienic® system utilises a central storage tank, with each area of the factory supplied through its own send and return hoses. These are connected through a specially designed "plug and play" manifold. This patented system ensures each offtake can be isolated individually. The adaptability, flexibility, and resultant cost saving is significant, translating directly into increased production efficiency, and performance, over the lifetime of the system. To find out how HydroGienic® can support your future water needs, please contact us.